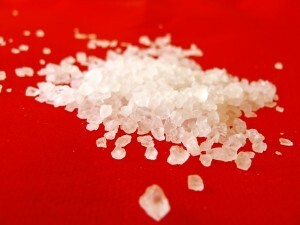 Salt is an essential component of food. Almost all kinds of food contain some amount of salt, whether it is a salty dish or a sweet pudding. It is either added or is a natural component of the raw material. Commonly called as table salt, its chemical composition is sodium chloride. Both components ‘sodium’ and ‘chloride’ play an essential role in our body. Sodium is mainly responsible for water retention and the serum osmolality level (blood concentration of electrolytes). The chloride ion frequently appears in combination with the sodium ion. Their levels in the body are regulated by the kidneys and are influenced by the hormone aldosterone. Sodium and chloride are excreted in urine. Small amount is also excreted in sweat and stools. Sodium plays a role in metabolism of almost all cells in our body. The two most important functions of sodium are water balance and neuromuscular activity. Sodium helps in water transport. Wherever sodium is absorbed, water goes in to maintain equilibrium of electrolyte concentration. The normal concentration of sodium in the extracellular fluid is 135–146 mEq/L. A decreased serum sodium level is known as a sodium deficit or hyponatremia, and an elevated serum sodium level is known as a sodium excess or hypernatremia. Transmission and conduction of nerve impulses requires the activity of sodium-potassium pump, where these electrolytes are exchanges across cell membrane. Sodium plays an active role in the regulation of acid-base balance. It combines with chloride or bicarbonate to regulate the acid-base balance. Salt imbalance can be a life threatening condition. Chloride accompanies sodium everywhere and hence plays a role in cellular metabolism. When sodium is retained, chloride is frequently retained, causing an increase in water retention. The chloride ion is an important factor in acid-base balance and the acidity of gastric juice. Chloride combines with the hydrogen ion in the stomach to form hydrochloric acid. The acid acts as a first line of defence against the food that we eat. It not only helps in digestion but also destroys all harmful bacteria present in food. The normal serum chloride range is 95–108 mEq/L. A decreased serum chloride level is called a chloride deficit or hypochloremia, and an elevated serum chloride level is known as chloride excess or hyperchloremia. Sodium: corned beef, potato chips, ham, olives, pickles, tomato juice, bacon, decaffeinated coffee. Chloride: milk, cheese, fish, crab, dates. In many conditions or diseases, patients lose a lot of electrolytes. These include diarrhea, excessive sweating in hot and humid working conditions, high fever and burns. In these conditions salt is replaced along with water. Normal saline, which contains these components, is given intravenously. Dietary requirement of sodium is 2–4 grams daily and chloride is 3–9 grams daily. As we know that water goes along with sodium, salt is restricted in patients with hypertension and congestive cardiac failure. This is because salt increases volume of blood in the blood vessels thereby resulting in a rise in blood pressure. An increased or uncontrolled salt intake may result in a very high blood pressure which may cause headache and stroke due to brain hemorrhage. In patients with cardiac failure, more salt intake which increases blood volume will increase the workload of heart which is already compromised and will aggravate the condition. In patients with swelling or oedema of legs, salt is restricted to reduce oedema which results due to accumulation of fluid in dependent parts of our body. Salt is an essential requirement to sustain life. A balance in the body has to be maintained normally. Whenever this balance is shifted by any disease, it has to be rectified quickly to save life.